With fall comes football, dropping temperatures, pumpkin spice everything, and of course, plenty of baking. Fall and winter are probably when I spend the most time in the kitchen, and it’s got me thinking about decorating kitchens. 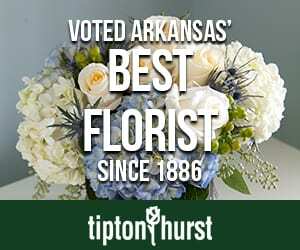 Usually I like the look of an all-white kitchen space, with clean marble counter-tops and maybe a mirrored back-splash. But a few darker, more colorful kitchens have caught my eye recently and it has me totally re-thinking the traditionally neutral space — why not cover my refrigerator door in floral paper? 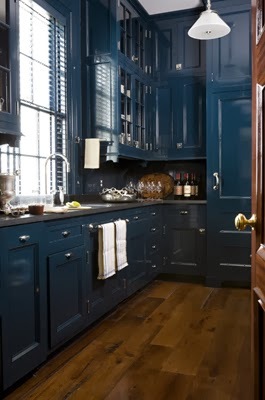 Why not lacquer my entire kitchen in a vibrant jewel tone? Here are some snapshots that have me inspired. 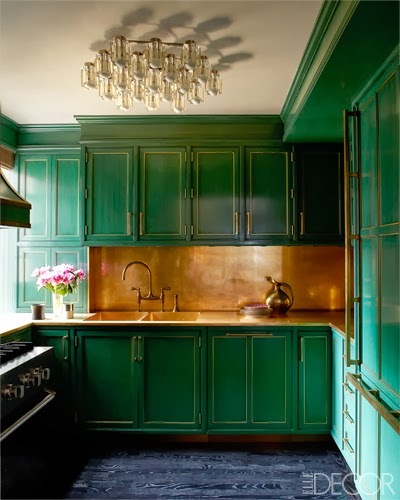 Kelly Wearstler gave Cameron Diaz’s New York kitchen a heavy dose of glamour — emerald green cabinetry is married perfectly with brass back-splash and fixtures. From Elle Decor. When you’ve got a small space to work with, the bolder the better in my opinion. 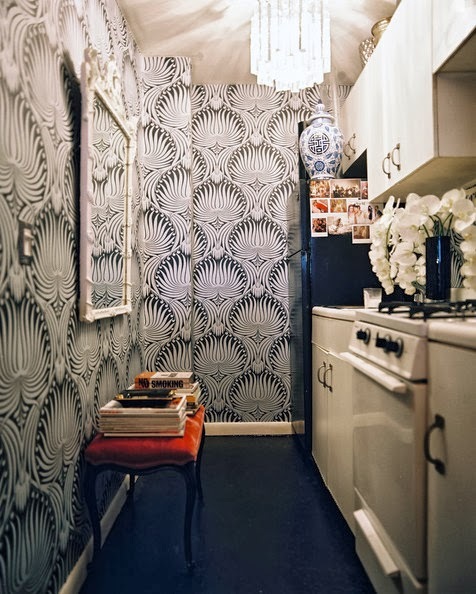 This kitchen featured in Lonny proves that with glamorous wallpaper and antique touches. 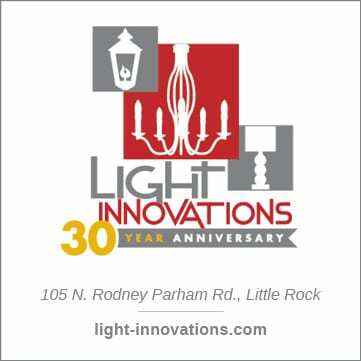 Leave it to Miles Redd to take just one color and knock it out of the park. Wouldn’t you feel so sophisticated in this space?? 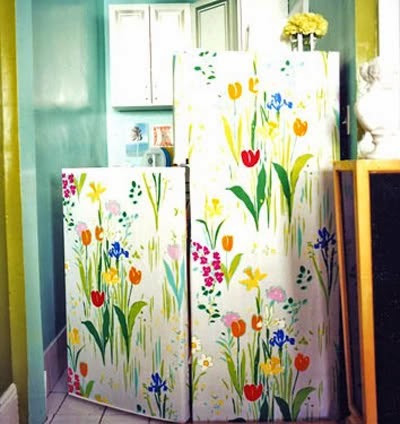 Nick Olsen, whose apartment was featured in Domino, famously papered his refrigerator door. While I think my landlord would be thoroughly displeased with me, I can’t get enough of the idea. The bright pink cabinets in this room make me smile. And that fun chandelier! Imagine waking up and having breakfast here — how could you have a bad day after that?? 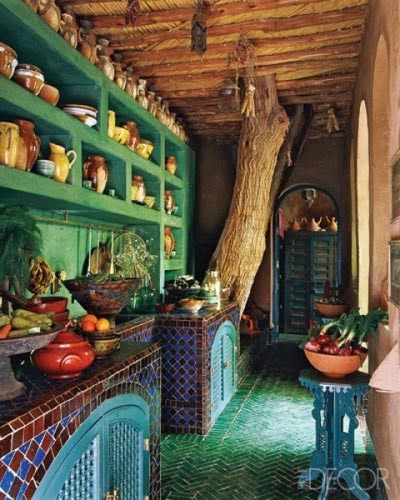 A Moroccan kitchen makes a bold statement with vibrant tiles and fabulous pottery. Mary McDonald mixes patterns and styles in this little kitchen nook, but the black and white palette keep it chic. I would love to serve breakfast here. What about your kitchen? Do you keep it traditional with all white or does yours have a colorful touch?